Sphynx look for heat, even from a dog. "Wow, is that cat really hairless?" you might ask. Looking at the sphynx cat breed, you might be puzzled over the apparent lack of hair. Could a cat be any more wrinkled? Whether you think they're cute or ugly, you have to admit that the sphynx cat is fascinating. No, they're not entirely hairless. Sphynx cats lack a main coat, but they do have a soft, downy fluff that makes their skin incredibly soft and touchable. Some compare their coats to chamois in softness. Many have hair on their toes, noses, and tails. What's more, the hairless gene is recessive, which means that if a sphynx breeds with a normal-coated cat, all their kittens will have hair. 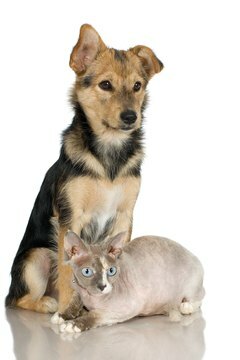 However, if two cats of a sphynx and normal-coated cat cross breed, one-fourth of the kittens should be "hairless." Don't they get cold? Yes, they do. You would too if you ran naked. Sphynx cats know that humans equal warmth. They're not picky, though, and will sleep with other cats and even (ahem) dogs. So they're natural heat seekers, willing to cuddle up to anything that feels toasty. Sphynx owners often dress them in sweaters, but unlike their finicky, proud hair-covered relatives, sphynx cats aren't embarrassed to wear them. They also sunburn easily, so they need cat-safe sunscreen. Despite the name, the sphynx cat isn't from Egypt. Instead, the sphynx hails from a genetic mutation that appeared in a litter of kittens in Canada in 1966. The sphynx warmed cat fanciers' hearts, even if it was born in a country with winters ill-suited for hairless cats. Other cat breeders soon were able to breed hairless cats from cats with normal hair. They then bred these cats to sphynx cats to produce more hairless cats. 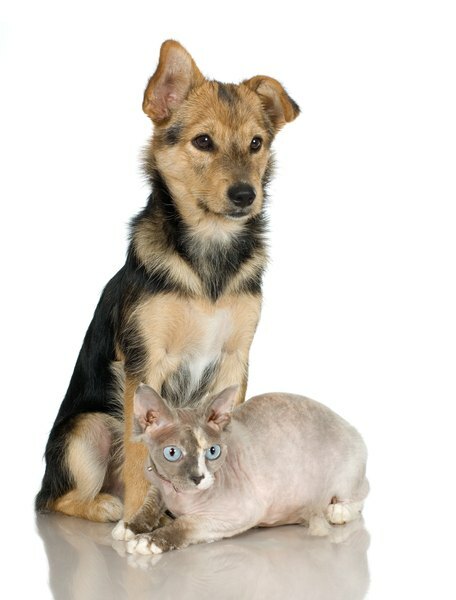 In 1975 and 1976, two hairless cats appeared naturally in Minnesota from the same mother, but different litters. These natural sphynxes were added to the sphynx breeding program. The sphynx isn't the first hairless cat, though. In the early 1800s there were hairless cats in Mexico (appropriately called "Mexican hairless"). These cats were the last of their line and not much more is known about them. If you're looking for a cat who is hypoallergenic, the sphynx probably isn't for you. Sphynx cats still have dander -- the main cause of many people's allergies. People are normally allergic to the proteins in cat saliva, so if you're looking for a cat that won't trigger your allergies, the hairlessness won't help. The Cat Fanciers' Association Complete Cat Book; Mordecai Siegal, Ed.